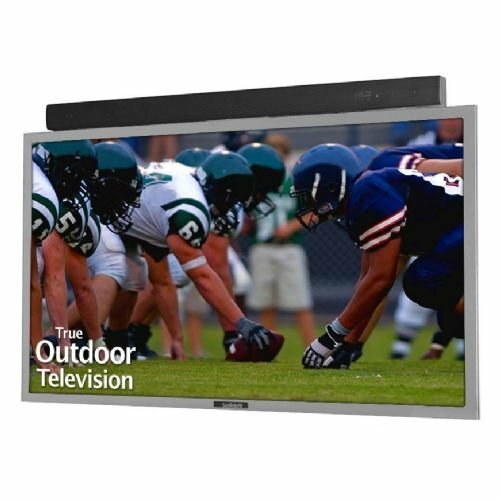 The 55" slim Signature Series outdoor HDTV is engineered for permanent outdoor installation. The SB-5570HD is an all-weather, durable outdoor HDTV that looks like a "fancy, schmancy" indoor LED TV. Its powder-coated aluminum exterior protects the unit in temperatures from -24 to 122 degrees F.
Dressed to impress with full-HD 1080p LED bright screen for improved outdoor viewing. Ready for outdoor living on any deck, patio, gazebo or pool-side. This unit - and all SunBriteTV models - are engineered to stay outdoors - in rain, snow, foggy mornings and hot summer days. Place the SB-5570HD under a roof eave or over-hang - away from direct sun - for ultimate viewing enjoyment. Although our Signature Series TVs are engineered for outdoor use - such as within a partially enclosed patio, gazebo or shaded deck - the LED screen is not meant for direct sun viewing. For direct sun use, see our Pro Series outdoor HDTV collection. The SB-TS557 stand is sold separately. We also offer all-weather non-articulating (SB-WM46NA) and articulating (SB-WM46) wall mounts for this model.